Excerpts from “El golpe posmoderno. 15 lecciones para el futuro de la democracia”, a book by Daniel Gascón, 20018, Penguin Random House Grupo Editorial. The economists Manuel Hidalgo and Jorge Díaz Lanchas wrote in Agenda Pública an article entitled “Don’t Say Robbery When You Mean ‘Welfare-State’”. Studying the results between 1980 and 2013, they explained that it would be wrong to consider Catalonia as worse treated than the rest. A large part of Catalonia’s prosperity was related to its economic integration with the rest of the country, as well as the capacity to benefit from education, factorial endowment (human, business and even institutional capital) or geographical advantages. “Catalonia, together with Balearic Islands and Madrid, are the maximum net contributors to the rest of Spain. On the contrary, Extremadura, Canary Islands and Asturias are the regions that received more”. Regarding the origins of the fiscal deficit, it is not caused by the expenditure as much as by the income due to its high income per capita”, the economists explained. 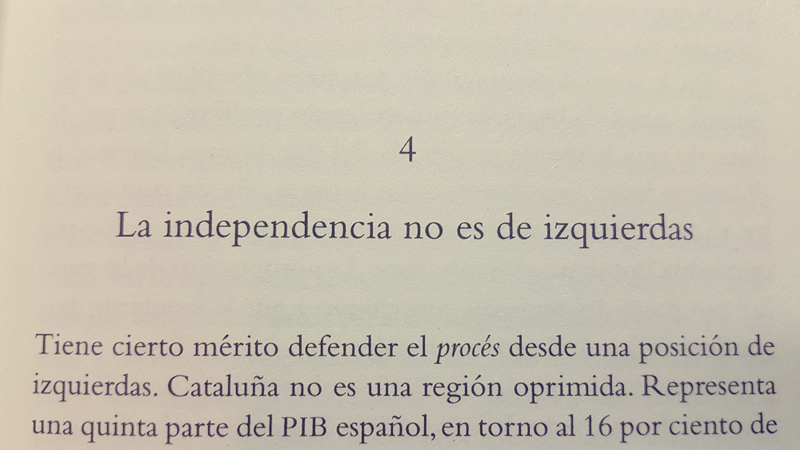 “If Catalonia has become a major contributor region to the public treasury is due to the mechanisms created by the Welfare State for citizens and not for lands”. In recent times, secessionism has been pursuing an apparently hyper-democratic strategy of radicalism and participation. Jorge San Miguel has defined the right to decide as “the Catalan Macguffin”. Its utility resided in the fact that “it allowed to stretch the gum of the nation-building process even if a pro-independence nationalist majority was longer in coming than planned. To do so, discourses putting democracy —in a plebiscitarian sense— ahead of the nation were circulated, and figures ostensibly unaffiliated to the Catalan traditional elites who […] statistically are just promoted tokens in the effort to represent and attract classes significantly absent from successive nationalist governments and the nationalist government. The paradox is that, precisely because the sums did not add up for a declaration of independence, the ‘right to decide’ was invented —if the journey to Ithaca was more important than the destination of arrival, the vote became the pursued object to conceal the reality of the secessionist project, to buy time and add wills”. To describe this plebiscitary conception of democracy, Jorge San Miguel employs the Schmittian term “decisionism”.